Nearly five years ago my life took an unexpected turn and I became an adoptive mother. It wasn’t as if I didn’t have enough on my plate with work, kids, travel and the daily fires in my life, but I wanted more. I wanted a dog. Since the loss of my beloved Dalmatian, Clinton, years earlier, I wasn’t sure I could ever withstand the loss of a pet again. But I noticed I loved visiting friends who had dogs. On occasion I pet sat for friends away on vacation. I petted and cooed at the dogs of strangers until they nervously walked away. I was definitely ready. My family, not so much. My dreams tend toward the super-sized. When I dreamed of owning a home, I bought a huge Victorian. When I dreamed of a family car (anything but a minivan) I wound up with a truck so large a friend teased that it needed a back up beeper when I put it in reverse. And who has four kids nowadays? Queen of Big Dreams, that’s who. So when I dreamed of owning a dog, I imagined big dog, lovable and gentle. And it just so happened that my big dream coincided with a friend’s big dream of giving away a very big, lovable, and gentle dog. My big dreams yielded Nola. 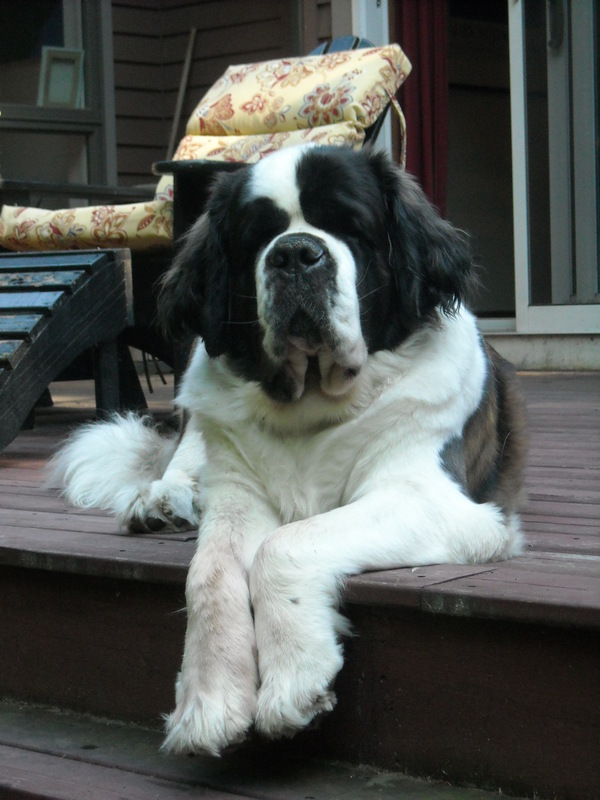 Big, lovable, and gentle, but also a nervous, clingy, messy, untrainable, snoring Saint Bernard desperate for a family to love and a belly to be scratched all day….every day. It was a love affair that mystified most. “Do you smell her?” family members asked. I didn’t. “Doesn’t that snoring bother you?” they inquired. I thought it was cute. What they didn’t see was the constant companionship she provided. How she labors upstairs to sit with me while I work. How when she places her big paw on my lap and gazes into my eyes, my heart soars with love. I am often short on time and she is often short on stamina, so our daily walks are a brief, welcome reprieve from work. When twice she became gravely ill, she reminded me to pay attention to the ones you love. As a big girl, she’s not a squirrel chaser, but watching her sit on the deck each morning after her breakfast, observing the squirrels run and contemplating the deer grazing while the wind ruffles her fur, reminds me to slow down and appreciate nature. When we leave her alone, she sleeps peacefully to a nice jazz station until we return. She barks only when absolutely necessary, (as in when she’s ready to go out on the deck to observe squirrels), which reminds me that my constant barking at the kids and my husband is often unnecessary. When she stretches her girth in the middle of the kitchen floor, forcing each of us to step and stumble over her, she reminds me that we all like to sometimes feel we are at the center of someone’s universe. She reminds me that a good long nap does a body good. She reminds me that a family who loves you, a good meal, music, fresh air and relaxation are the basic necessities of life. End of story. Bigger is not always better. I’ll never stop dreaming big, but it took Nola to help me realize that sometimes, big dreams can help you see the beauty in the small. This entry was posted in Uncategorized and tagged dogs, dreams, Family, jazz, relaxation, squirrels, st. bernards. Bookmark the permalink. Adorable tribute to a fine and worthy canine.